It’s Friday and we thought a feel good story was a good idea. We’d like to share the happy news that a Boston marathon bombing survivor is going to marry the firefighter who took care of her that life-changing and devastating day. He kept coming back to visit her in the hospital. Their friendship and love grew as they got to know each other. Because a Nurses job is to help people whether it’s caring for their patients, doing research to improve patient care, or educating our future Nurses, a firefighter’s job is to help their community too. Both professions selflessly help people in a variety of situations, some extremely difficult. As a website devoted to Nurses within Diverse communities, we see many similarities within the 2 professions and we hope you enjoy this story. 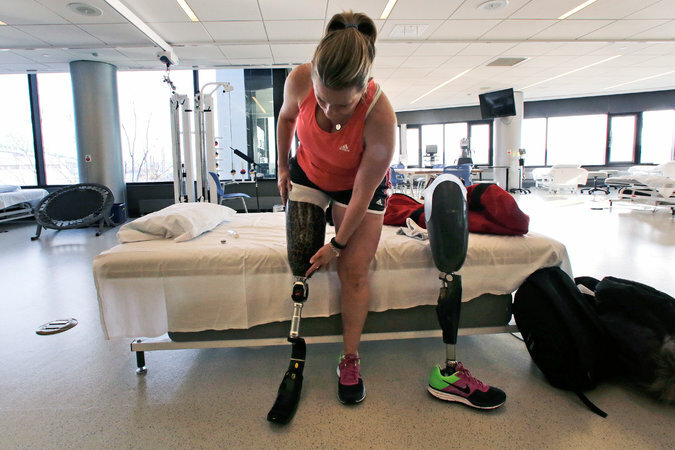 When Roseann Sdoia was gravely injured in the Boston Marathon bombings in 2013, Michael Materia, a firefighter, was the responder who took her to the hospital. They were strangers at the time, but he has rarely left her side since. In December, the two decided to get married. And on Wednesday, they took on an entirely different kind of challenge together: walking up the 1,576 steps to the observation deck of the Empire State Building in Manhattan to raise money for the Challenged Athletes Foundation — an organization that has played a major role in Ms. Sdoia’s recovery. Just as he had on the day they first crossed paths, Firefighter Materia wore all of his firefighting equipment, including a heavy oxygen tank on his back. She wore a prosthesis, which has replaced the leg she lost on the day of the bombing. The day they met was among the darkest in Boston’s modern history. After two bombs were detonated on April 15, 2013, smoke billowed across the finish line and the scene erupted into chaos. Hundreds of people were injured on that Monday, and three people lost their lives. Had it not been for Firefighter Materia, it might have been four. Ms. Sdoia’s right leg was severely injured in the explosion. A bystander rushed over and fashioned a tourniquet to stop the bleeding. Firefighter Materia, responding with his fire brigade, was put in charge of escorting Ms. Sdoia to the hospital. With no ambulance immediately available, she found herself lying on a metal bench in the back of a police transport vehicle. Firefighter Materia stuck with her until they reached the hospital, where Ms. Sdoia’s right leg had to be amputated above the knee. He visited again a few days later to offer assistance, and then again the day after that. After a couple of months, a friendship between the two bloomed into a romance. “There was an interest growing in each other, kind of quietly, until we talked about it,” Ms. Sdoia said. Firefighter Materia popped the question on Dec. 4 during a trip to Nantucket. They intend to marry in October or November, according to The New York Post, which reported on the couple this week. But before they get married, Ms. Sdoia, 48, and Firefighter Materia, 37, decided to take on New York City. On Wednesday evening, Mr. Materia pulled on his fire equipment while Ms. Sdoia explained her strategy for the climb: Go slow and steady, and lead with the left leg. The couple were among hundreds of runners who made the arduous climb on Wednesday for an annual event called the Empire State Building Run-Up, which is in its 40th year and benefits the Challenged Athletes Foundation. For months, Ms. Sdoia trained on the steps of Bunker Hill Monument, a towering obelisk just north of Boston commemorating the Battle of Bunker Hill, among the defining moments in the Revolutionary War. The event at the Empire State Building was a fitting milestone in Ms. Sdoia’s own battle. Along with Firefighter Materia, the lifelong Red Sox fan has become something of a hero for Boston, where friends and family have followed her recovery, celebrated her engagement, and supported her efforts to climb New York City’s third-highest building. The race ended at the observation deck on the 86th floor of the skyscraper, where Ms. Sdoia smiled and stopped to chat with photographers in the chill winter air while Firefighter Materia, camera-shy, stayed mostly quiet under his firefighter’s helmet.